11189 ESS SENEGAL (1961) Rowing piroques*. Trial color proofs in vertical strip of 5 with multicolor. Scott No 203, Yvert No 206. Fascinating! 18582 ESS SENEGAL (1961) Horse race*. Trial color proofs in strip of 5 with multicolor. Scott No 204, Yvert No 207. 18899 ESS SENEGAL (1961) Piroques racing*. Trial color proofs in strip of 5 with multicolor. Scott No 203, Yvert No 206. 9018 ESS SENEGAL (1965) Abdoulaye Seck*. Trial color proofs in strip of 5. Director of the Senegal Institute of Agricultural Research. Scott No 245, Yvert No 250. 11000 ESS SENEGAL (1965) Dakar post office. Trial color proofs in strip of 5. Scott No 246, Yvert No 251. 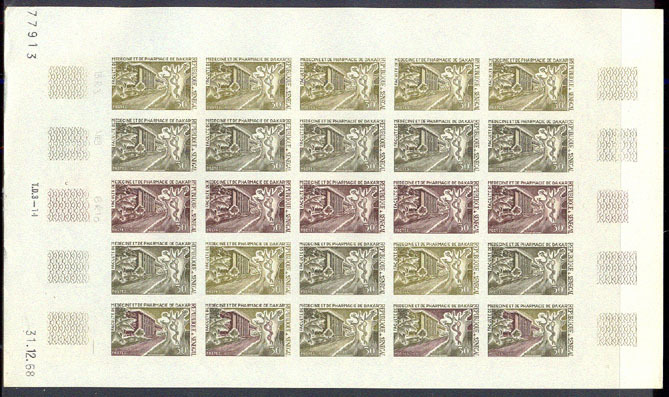 9530 ESS SENEGAL (1966) Jean Mermoz*. Trial color plate proofs in strip of 5 with multicolor. Mermoz was a spectacular aviator sometimes referred to as the French Lindbergh for his historic first flights. Scott No C51, Yvert No PA57. Beautiful! 16318 ESS SENEGAL (1966) Dolls of Gorée*. Set of 4 trial color proof strips of 5. Scott Nos 261-4, Yvert Nos 266-9. 453 ESS SENEGAL (1967) Dakar-Yoff airport*. Trial color proofs in strip of 5 with multicolor. Scott No C52, Yvert No PA58. 16890 ESS SENEGAL (1967) Lyre-shaped megalith*. Trial color proof strip of 3. Scott No 295, Yvert No 300. 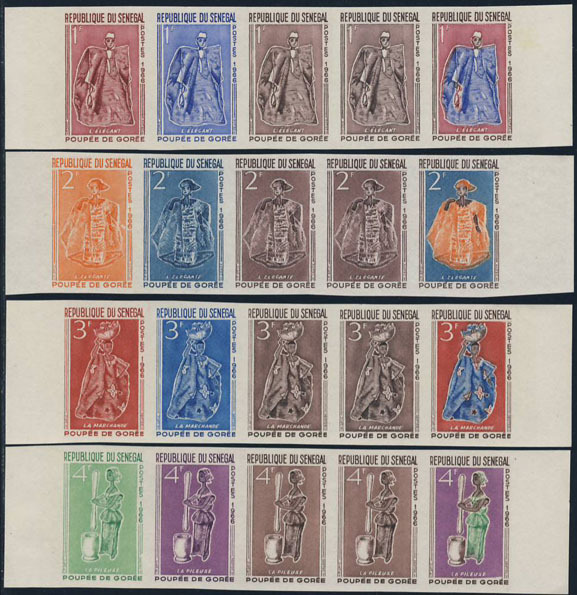 4650 ESS SENEGAL (1968) Caduceus*. School of Medicine & Pharmacy*. Trial color proofs in full sheet of 25. Scott No 310, Yvert No 315. 16070 ESS SENEGAL (1969) Panet*. Camels*. Map of Sahara*. Trial color proofs in strip of 5 with multicolor. Scott No 312, Yvert No 317. 3501 ESS SENEGAL (1972) Élégance sénégalaise*. Essais de couleur en bande de 5. Yvert No 373, Scott No 371. Très beau! 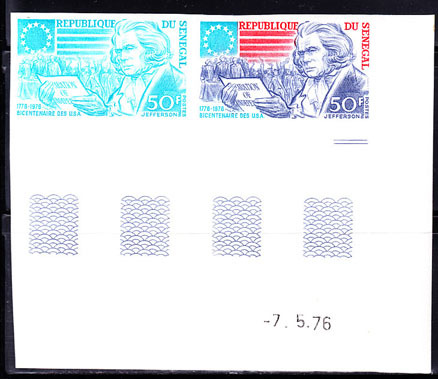 15567 ESS SENEGAL (1976) Thomas Jefferson. Declaration of Independence. American flag. Trial color proof pair. Scott No 430, Yvert No 433.